Leap Motion unveiled its new gesture control technology earlier this week, along with videos showing the system tracking ten fingers with ease and a single digit slicing and dicing a grocery store's worth of produce in Fruit Ninja. Still, doubts persisted as to the veracity of the claim that the Leap is 200 times more accurate than existing tech. So, we decided to head up to San Francisco to talk with the men behind Leap, David Holz and Michael Buckwald, and see it for ourselves. Join us after the break to learn a bit more about Leap, our impressions of the technology, and a video of the thing in action. Before diving into the more technical details of the device he created, Holz told us about the genesis of his idea to create a better way for humans to interact with their computational devices. The idea to do so came during his days acquiring a Phd in mathematics from UNC and while working in fluid mechanics. You see, there's a problem with creating and manipulating 3D models using a mouse and keyboard --it's a needlessly complicated operation involving clicks and drop down menus. Holz wanted a way to make "molding virtual clay as easy as molding clay in the real world." After four years of research and many iterations of hardware, the Leap was finally finished. We asked both Holz, and Buckwald about the underlying technology that enables such high-fidelity controls, and were told that it's an optical system that tracks your fingers with infrared LEDs and cameras in a way unlike any other motion control tech. This new method of motion sensing is why the Leap can be made so cheaply and come in such a small package. It can track hundreds of thousands of points at a time (note: point tracking isn't how it functions), and because its precision scales up or down according to the hardware it's connected to, it only uses one to two percent of a CPU's capabilities to work. To protect all of the IP inside the Leap, the firm has a slew of patent applications in the pipeline, which is why, despite our efforts, we couldn't extract more info about the hardware and its workings. In practice, the Leap is impressive. As anyone who's waved at Kinect or held a Wiimote in hand can attest, mass market motion controls are far from precise... Leap Motion's technology isn't. We tested it out using one of the company's prototype units, which is a bit larger than the final version, but Holz assured us that the user experience with each is identical. Using the Leap is easy, simply connect it to your computer via USB and install Leap's software, wave your hand in the space above the sensor, and it starts tracking any finger pointing at the screen. Whether we were slicing watermelons in a Fruit Ninja demo or drawing minuscule curlicues in a 3D-drawing app, the Leap followed our phalanges' every move on all three axes with nary a hiccup. The company touts the system's incredibly low latency -- faster than a monitor's refresh rate and below the threshold of a human's ability to sense it -- and we can confirm that there was zero perceptible lag during our demo. Because Leap works with any machine that has touch drivers onboard (whether for trackpads or touchscreens) using it is quite intuitive, and means that the technology is backwards compatible with existing apps. Naturally, Holz and Buckwald are keen to see developers create custom applications to take full advantage of the technology, and we gotta say, so are we. 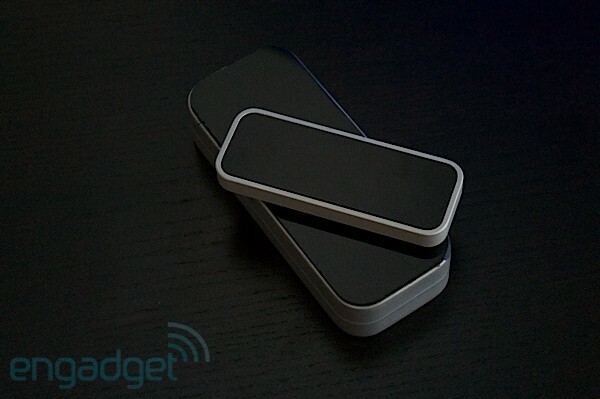 What's next for Leap Motion? Well, Holz and Buckwald told us that while the technology is initially available in peripheral form, the plan is to get it baked into laptops, desktops, smartphones and tablets, too. Because the hardware is so small, it can easily be stuffed into such devices. And, it'll work even better when embedded because there's greater flexibility in the placement of the hardware relative to the user's hands, and multiple sensors can be included to create a larger virtual workspace. We asked when we could expect to see Leap-enabled laptops, and were told that the company is in talks with several big hardware manufacturers to do just that. So, in the not-so-distant future, it seems we may all be waving our hands in front of screens instead of swiping and tapping on them.